The small photos are the first ones we have of the children. The larger photo is taken 3 years into the programme. The full profile is written entirely by the children themselves. Coming soon: Julius, Kevin, Miriam, Victor, Kephas and Jacob's profiles. Lillian was 13 when we took her on. She is naturally sociable and a group leader. For the first 10 workshops she was always the first one to speak in front of the group. 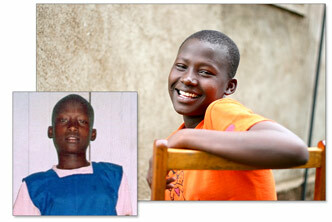 She faced her challenges, becoming pregnant in secondary school being one of the harder ones. She showed great perserverance and is now at University studying to become a teacher. When Fred started with us he was unable to look me in the eye. He often shed tears in our meetings, unable to communicate past his shyness. With genuine charm Fred was soon taken under the wing of the group and developed his ability to speak one on one and publicly, owning up to the problems he identified for himself as lack of ability to steer his own course. 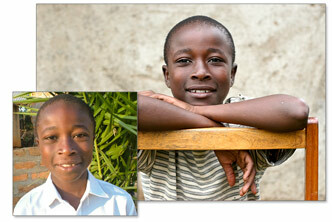 Fred has made terrific progress and is now studying at Moi University to become a teacher. Jonathon started out as a terrified shy boy always sitting with his head down. 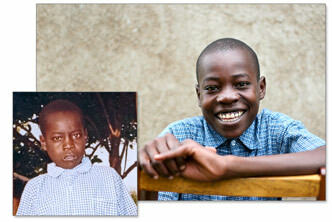 He had some quite serious health issues that we worked through with a lung specialist in Kisumu. Jonathon had difficulties with his extended family and has had to navigate through the expectations they put on him with the expectations we have. Clearly inspired by the group, Jonathon started a "Beautification of the School" programme applying what he had learnt from our recycling field trip to daily life. He is currently studying for a degree in media communications.